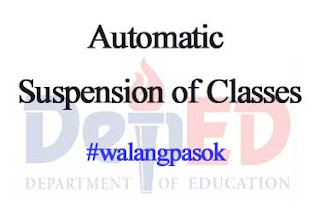 Department of Education (DepEd) Secretary Armin A. Luistro issued the automatic cancellation / suspension of classes guidelines for both public and private schools. The DepEd Oder No. 43 was released last May 28, in compliance to the Guidelines on the Implementation of Executive Order No. 66. The Executive Order No. 66 was entitled for "Prescribing Rules on the Cancellation or Suspension of Classes and Work in Government Offices Due to Typhoons, Flooding, Other Weather Disturbances and Calamities." - All public and private pre-school and kindergarten classes in the affected areas shall be auto cancelled or suspended. - All public and private preschool, kindergarten, elementary, and secondary classes in the affected areas shall be auto cancelled or suspended. - All public and private preschool, kindergarten, elementary, secondary, and tertiary classes, and also work in all DepEd offices in the affected areas shall be auto cancelled or suspended. And take note of this, depending on the time when PAGASA announced the signal numbers. If they announced it at 10:00 pm. and 4:30 a.m. of the following day, classes in appropriate levels for the whole day are declared automatically suspended. And if they declared at 11:00 a.m. that day are likewise automatically suspended. Above all, Secretary Armin A. Luistro also cited that any decision to cancel or suspend classes must come from the local government. No announcement should originate from the DepEd, it should be first made from what PAGASA has already announced in the areas under a typhoon signal. For the meantime, If you feel that this details are informative, please bookmark it now or visit this site more often for you to be updated. You may also share this post to your friends so they may know about Auto Cancellation or Suspension of Classes Guidelines. Comments or suggestions about "Auto Cancellation or Suspension of Classes Guidelines" is important to us, you may share it by using the comment box below.